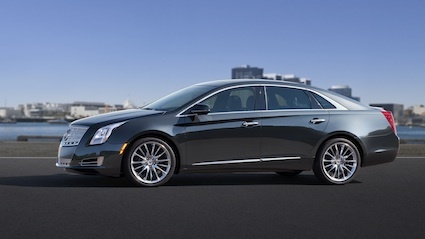 The newest model in the Cadillac arsenal is its XTS sedan, a larger five-passenger vehicle powered by its front wheels. All-wheel-drive is optional. New for the 2013 model year, the Cadillac XTS replaces a pair of discontinued sedans: the STS and the DTS, formerly known as the Seville and the DeVille respectively. 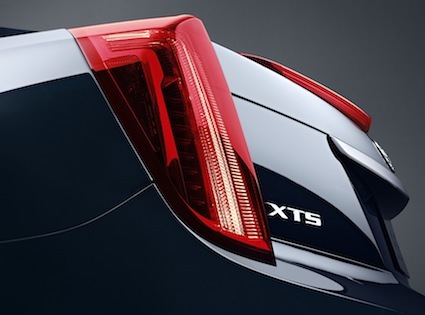 The all-new XTS advances Cadillac’s art & science design language; it also brings with it new technologies including CUE, a driver interface, and new safety features. 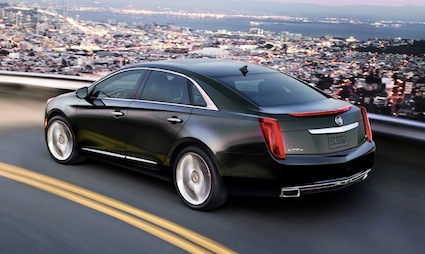 Priced from $44,075, the Cadillac XTS tops out at $61,805. 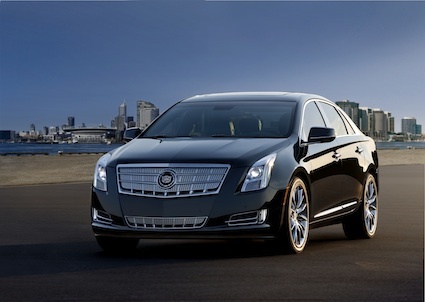 The 2013 Cadillac XTS is powered by a 3.6-liter V-6 engine. This 24-valve motor is of aluminum construction and features direct injection to produce 304 horsepower at 6,800 rpm and 264 foot-pounds of torque at 5,200 rpm. With an 11.5 to 1 compression ratio, this engine measures 3.7 inches bore by 3.37 inches stroke. Cadillac pairs its engine with a next generation Hydra-Matic 6T70 6-speed automatic transmission. This powertrain combination is the sole offering for the XTS. Ample performance does not come at the expense of fuel economy with the Cadillac XTS. Choose the front-wheel-drive edition and your sedan gets 17 mpg city, 28 mpg highway. The all-wheel-drive model delivers nearly the same fuel economy, coming in at 17 mpg city, 27 mpg highway. You get a 19-gallon fuel tank with the FWD XTS and a 20-gallon fuel tank with the AWD model. With a cruising range of approximately 560 miles, you can travel from San Francisco to San Diego on one tank of regular grade gasoline. Cadillac’s XTS sits on a 111.7-inch wheelbase and is 202.0 inches long, 72.9 inches wide and 59.4 inches tall. The FWD model weighs from 4,006 pounds; the AWD edition from 4,215 pounds. Passenger volume measures 104.2 cubic feet and trunk space is 18.0 cubic feet. The XTS can pull up to 1,000 pounds. Front head room measures 40.1 inches; there is 37.8 inches in the rear. Front leg room comes in at 42.8 inches; rear leg room is 40.0 inches. Front shoulder room measures 57.9 inches; rear shoulder room comes in at 56.3 inches. Front hip room is 55.1 inches; rear hip room is 54.3 inches. The 2013 Cadillac XT rides on 19-inch painted aluminum wheels with chrome insets. Polished aluminum 19- or 20-inch wheels are also available. All-season blackwall tires are standard. Four XTS trim levels are offered including standard, luxury, premium and platinum editions. Standard across the model line is magnetic ride control, front Brembo brakes and a Bose audio system. Inside, each model features front bucket seats with 10-way power driver and front passenger seat adjusters along with 4-way manual head restraint adjust. Seats are trimmed in leather and include lumbar control. The rear seat is of 60/40 split-folding design with a lockable rear pass-through compartment to the trunk. If you are not familiar with Cadillac CUE, the XTS and other 2013 Cadillac models will soon familiarize you with this new technology. CUE or Cadillac User Experience is an infotainment system featuring a customizable interface. CUE makes use of an 8-inch screen in the center stack and includes the faceplate below the screen along with its steering wheel controls. For people familiar with electronic gadgets such as Apple’s iPad, you can use similar hand gestures to adjust the screen. CUE also makes use of voice recognition technology. 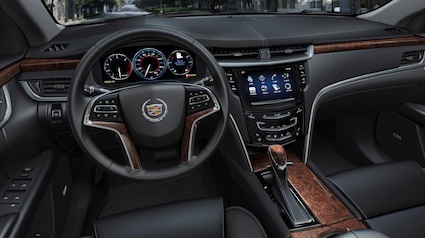 The XTS also offers a 12.3-inch reconfigurable instrument cluster. You can go beyond the standard settings to choose one of four possible screen layouts. The information supplied includes readouts for fuel levels and speed, navigation, phone and entertainment information. Every 2013 Cadillac XTS features keyless entry, push button start, a steering wheel with power rake and a telescoping feature, rear park assist and a universal home remote. Choose the luxury package and amenities such as a rear back up camera and daytime running lamps are included. The premium models includes CUE upgrades, a 14-speaker Bose audio system and tri-zone climate control. The platinum model brings in larger wheels, a panoramic sun roof, a rear window power sun shade and manual side rear window sun shades. Safety features galore are available with the Cadillac XTS. Every model offers OnStar with its turn-by-turn navigation assistance, stolen vehicle slowdown and crash assist. A driver awareness package is standard on the premium and platinum editions and is available with the luxury model. These features include lane departure warning, forward collision alert, a safety alert seat that vibrates to warn you, side blind zone alert, rear cross traffic alert and a reflected LED display. A driver assist package is available beginning Fall 2012 and is standard with the platinum edition and available with the premium model. This package features the driver awareness package and brings in adaptive cruise control, front and rear automatic brakes, and automatic collision preparation. Other safety features include dual front seat knee airbags, a head-up display and more extensive adaptive cruise control.